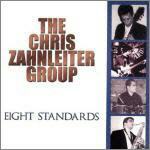 to the site of Jazz guitarist Chris Zahnleiter. Here you can find out about upcoming gigs, download lessons, transcriptions and much more. Chris is currently available for private and group lessons in the greater Phoenix, AZ area. Click here for details. You can catch Chris live with "Mill Avenue Jazz", a project with pianist John Mitchell, in the greater Phoenix, AZ area. Click here for where and when. You can check out the Mill Avenue Jazz website here. Chris is also currently working on a book on Jazz guitar chords and comping. Stay tuned for more details. Produced by C. Zahnleiter and D. Maher. Click here to buy CD.